Just one shopping trip this week. Mama was feeling puny with a bad cold so we stayed home from most things. I was at QFC Friday morning for milk again, but found all sorts of things. They were having a "Buy 6,save $3.00" sale so I bought 4 coffee creamers and 2 boxes of Ritz crackers. GF corndogs have been on my list for ages so I finally bough them and french fries, and I picked up another package of the $5.99/lb organic chicken breast. On clearance I found organic yogurt tubes for $2.29/box of 8, summer sausage for $1.99, lunchmeat ham for $1.99, organic yogurt tub for $2.39, and coconut curry chicken for the microwave for $3.59 each. 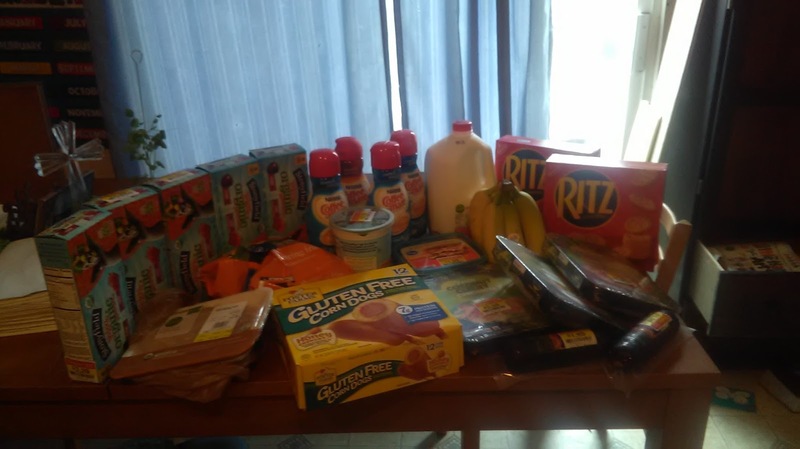 I spent $62.01 in total after store coupons I'd gotten in the mail for $1.50 off organic chicken, $0.50 off frozen potatoes, $0.50 off lunch meat, and $1.00 off Foster Farms corndogs. I also have been meaning to add in Girl Scout Cookies that I bought last month. My good friend's kids were selling them so I bought 8 boxes for $40 total.